Addicts on film and TV: accurate or insulting? 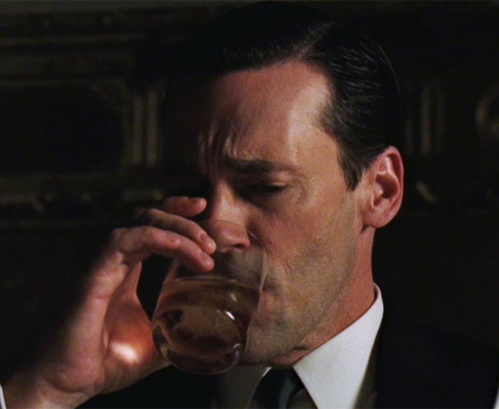 Is Mad Men's Don Draper an alcoholic? Is Don Draper an alcoholic? The season six finale of Mad Men airs this Sunday, and while many viewers are anxious to see whether that Megan Draper as Sharon Tate conspiracy will come to fruition, others can&apos;t help but wonder: will Don admit that he has a drinking problem? Slate recently published a piece about Don&apos;s obvious alcoholism that got tongues wagging. After all, what came off as a retro gimmick in Mad Men&apos;s earlier season ("Oh, they&apos;re drinking booze at the office. In the morning. During business meetings. Why can&apos;t my office be cool like that?") has turned into something far more sinister. Now, it would appear that Don is just a few drinks away from completely losing it. Jon Hamm does a great job in bringing pathos and realism to Don&apos;s downward spiral; however, other actors have been less convincing in their portrayals of addicts in denial. Sometimes they are at the mercy of bad writing or direction (i.e. when the screenwriters and/or director did not do their research in determing how an addiction actually affects a person and the people around them); while in other cases, the actor&apos;s own scene-chewing gets in the way of delivering a nuanced and truly accurate performance. William H. Macy on the Showtime drama Shameless. I also can admit, without a hint of irony, that Nicolas Cage&apos;s suicidal alcoholic in Leaving Las Vegas was the role he was born to play. Joan Allen in The Upside of Anger. All three women play characters with an unfortunate case of "rom-com alcoholism," meaning that their drinking doesn&apos;t amount to much more than a character quirk and quickly resolves itself by the story&apos;s end. I wasn&apos;t so crazy about watching John Belushi comically guzzle entire bottles of whiskey in Animal House either, considering his real-life struggles with addiction and eventual death from a drug overdose. These actors never fail to blow me away with their spot-on performances. Plus, everyone in Trainspotting (also one of my favorite films), Requiem for a Dream (particularly Ellen Burstyn&apos;s character) and Spun (terrible movie, eerily accurate junkies) left me with chills. Oh, and Christian Bale in The Fighter— Oscar well-deserved. Val Kilmer playing Jim Morrison in The Doors. They all play completely unrelatable characters who have nothing under the surface—their character&apos;s drug use is either too understated and romantized (Kilmer), laughably over the top (Pacino) or just tritely inconsequential and unrealistic in every way. Bullock and her participation in the most inauthentic rehab I&apos;ve ever seen on film. If there was an Oscar, Emmy or Razzie category for Best Portrayal of an Addict, who would you nominate?